Welcome to Reid, our marvellous suburb in Canberra, the national capital of Australia, in the Australian Capital Territory (ACT). The city of Canberra has been built on what early settlers named the Limestone Plains. The Ngunnawal people are recognized as the traditional owners of the area which was previously an important meeting place for a number of Aboriginal groups including the Ngambri and the Ngambri-Guumaal. Reid is situated on the flat land at the base of Mount Ainslie, is one of Canberra’s oldest suburbs and its largest heritage housing precinct. Reid’s history and heritage of Reid make it unique in urban planning. Reid provided housing for government officials and so is directly linked to the establishment of the Parliament of Australia. The uniformity of the dwellings – much of the form of the original housing stock (FCC & Department of Interior) is still recognisable even if, over time, alterations have been made. Its wide streets and verges are lined with deciduous trees & evergreen trees, plantings guided by Thomas Weston, officer-in-charge of afforestation, Canberra. 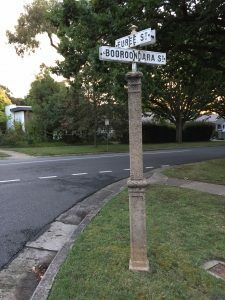 Most of the suburb of Reid is heritage listed and it is situated in close proximity to many of Canberra’s iconic buildings such as the Australian War Memorial and St John the Baptist Anglican Church. Reid is within easy walking distance from Canberra’s CBD and the suburb has many amenities including a tennis club, sports oval, churches, memorials, a preschool, Reid CIT, parks and is close to the Canbera Olympic Pool, Civic. 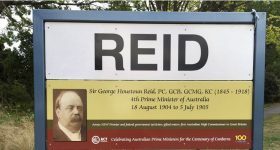 Reid is named after Sir George Houstoun Reid, Australia’s 4th prime minister and was gazetted as a suburb on 20 September 1928. Construction of Reid commenced in 1926. The Parliament of the Commonwealth of Australia had been meeting in Melbourne, Victoria, and was relocating to the new national capital, Canberra. There was an urgent need to transfer government officials to Canberra as the provisional Parliament House – now known as Old Parliament House – was scheduled to open in 1927. 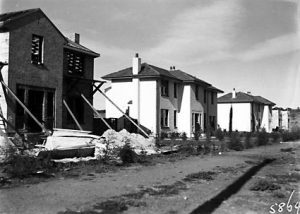 Public servants required accommodation and so the construction of the suburbs of Braddon, Barton, Forrest, Yarralumla, Ainslie and Reid was undertaken. Click for a timeline of Reid’s history. Street names in Reid are representative of all the principal Aboriginal languages and were selected in alphabetical order, radiating outwards from London Circuit. Discovering Milldenhall’s Canberra. The photographs of early Canberra taken by William (Jack) Mildenhall chronicle the construction of Canberra including Reid.